Pink Lady's Turkish Delight Bites will certainly tantalise taste buds! The soft rose water infused jelly is encased in superfine milk chocolate. They're ready to share, or for pure self indulgence! CONTAINS: Milk Products, Soy, Wheat. May Contain: Peanuts, Other Tree Nuts. Made in Melbourne from local & imported ingredients. 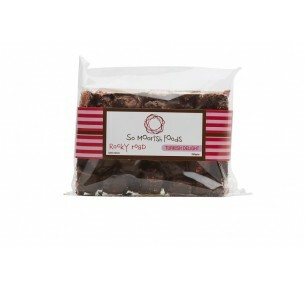 So Moorish Foods Turkish Delight Rocky Road is an exotic blend of Milk and Dark Chocolate,.. 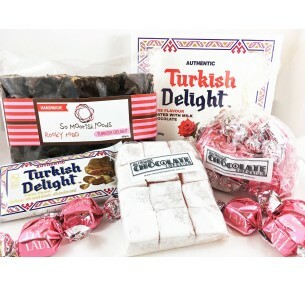 The Delightfully Turkish Gift Hamper will keep your tastebuds dancing until the very last bite: ..
Walker's Turkish Delight Thins are famous the world over: Milk Chocolate wafer thins with Rose f..